Virgin Galactic's suborbital passenger ship SpaceShipTwo flexes its feathered re-entry system during a pivotal glide test at the Mojave Air and Space Port in California on May 4, 2011. 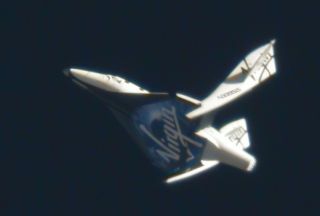 A private spaceship built to carry space tourists on suborbital flights for the company Virgin Galactic passed a major glide test flight while flying over California's Mojave Desert today (May 4): The spacecraft tested out the novel system it will use when re-entering Earth's atmosphere. Today's flight marked Virgin Galactic's seventh glide test for its first SpaceShipTwo spacecraft, called the VSS Enterprise, and took off from the Mojave Air and Space Port. The WhiteKnightTwo/SpaceShipTwo combo serves as a launch system, the backbone of Virgin Galactic’s aspirations to create a spaceline -- one that would whisk tourists into space on a suborbital trajectory. SpaceShipTwo vehicles are designed to carry six passengers and two pilots to the edge of space and back. The pay-per-view flights are billed as giving tourists a spectacular view of the Earth and several minutes of weightlessness. A per-seat price of $200,000 is being offered by Virgin Galactic. The space liner operations are backed by British billionaire, Sir Richard Branson, founder of the firm. For today's flight, SpaceShipTwo pilots tested the deployment of the craft's feathered re-entry system. The feathered re-entry concept -- first perfected on SpaceShipTwo's predecessor SpaceShipOne -- is an idea spawned by Scaled Composite founder, Burt Rutan. At the controls of the spaceship were Scaled Composites' test pilots Pete Siebold and Clint Nichols. The glide lasted roughly11 minutes and 5 seconds after release from the carrier plane, VMS Eve. SpaceShipTwo makes a May 4, 2011 landing on Runway 30 at the Mojave Air and Space Port in California. Touch down signaled the successful end to the craft's 7th glide test and, for the first time, evaluation of its novel feather re-entry system. morning's flight was a test pilot's dream," Siebold said. “The spaceship is a joy to fly and the feathered descent portion added a new, unusual but wonderful dynamic to the ride. The fact that it all went according to plan and that there were no surprises is a great testament to the whole team." Once SpaceShipTwo boosts itself out of the atmosphere, the entire tail structure of the spaceship can be rotated upward to about 65 degrees. In this feathered configuration, automatic control of attitude with the fuselage parallel to the horizon is achieved. This creates very high drag as the spacecraft descends through the upper regions of the atmosphere. According to Virgin Galactic fact sheets, the feather configuration is also highly stable, effectively giving the pilot a hands-free re-entry capability, something that has not been possible on spacecraft before, without resorting to computer controlled fly-by-wire systems. The combination of high drag and low weight -- due to the very light materials used to construct the vehicle -- mean that the skin temperature during re-entry stays very low compared to previous human-carrying spacecraft. In short, thermal protection systems such as heat shields or tiles are not needed. On a suborbital flight, following re-entry at around 70,000 feet, SpaceShipTwo’s feather lowers to its original configuration and the spaceship becomes a glider for the flight back to the spaceport runway and touchdown. "This morning's spectacular flight by VSS Enterprise was its third in 12 days, reinforcing the fast turnaround and frequent flight-rate potential of Virgin Galactic's new vehicles," added Virgin Galactic CEO and President George Whitesides. "We have also shown this morning that the unique feathering re-entry mechanism, probably the single most important safety innovation within the whole system, works perfectly," he added. The shakeout flights of SpaceShipTwo have been picking up speed. On April 22 and April 27 -- the fifth and sixth test flights for SpaceShipTwo -- saw the piloted craft dropped from high altitude by the WhiteKnightTwo carrier plane. The April 27 glide test marked SpaceShipTwo's longest flight yet: 16 minutes and 7 seconds, according to a Scaled Composites flight log. The rocket plane has been put through an ever-expanding set of flight objectives, starting with its maiden free flight on Oct. 10, 2010. These shakeout tests are leading to yet another milestone to enable commercial operation of the spaceship. While more tests of the SpaceShipTwo in free flight are expected, a major objective still to come are SpaceShipTwo missions involving short, medium and long blasts from the spacecraft’s hybrid rocket motor. Given a completed checklist of trial runs of SpaceShipTwo, commercial treks to the suborbital heights could begin next year at New Mexico’s Spaceport America. Whitesides said that today's milestone "brings us ever closer to the start of commercial operations. Credit is due to the whole Scaled team, whose meticulous planning and great skill are changing the course of history." Winner of this year’s National Space Club Press Award, Leonard David has been reporting on the space industry for more than five decades. He is past editor-in-chief of the National Space Society’s Ad Astra and Space World magazines and has written for SPACE.com since 1999.